To those of you dropping by for the first time: Hi! 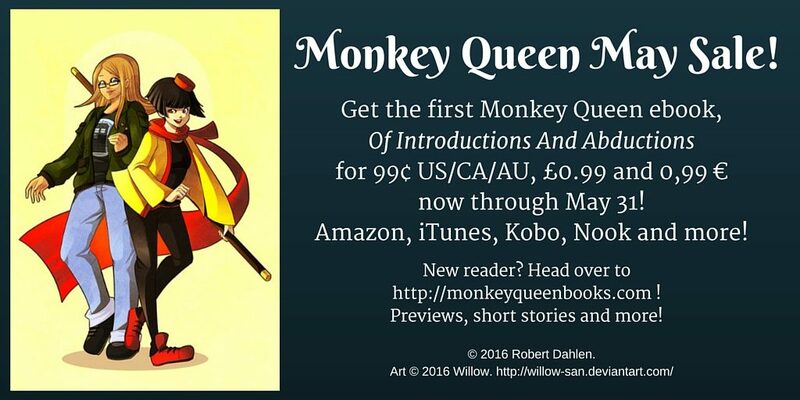 I’m Robert Dahlen, the author of the Monkey Queen novel series, in which Michiko (teenage hero with a wisecracking streak) and Beth (fangirl college student) team up to “save the world” (they’re starting small). It’s fantasy adventure with heroines, humor and heart, and a friendship that may be leading to something more. The first book, Of Introductions And Abductions, is on sale for just 99 cents US/CA/AU, £0.99, and €0,99 now through May 31! You can find all the sale links, and learn more about Michiko and Beth, after the cut! Tagged as May sale, sale! Regular visitors to this blog know that I love webcomics. One of my favorites is Max Overacts, about an aspiring child actor with an overactive imagination, written and drawn by ace cartoonist Canaan Grall. It’s been on hiatus recently due to his health issues. He’s been diagnosed with a brain tumor, and will undergo surgery next month. He won’t be able to work for several months after the surgery, and his family’s finances will be taking a major hit. A relative has started a GoFundMe page to help cover their expenses. I know money is tight all around, but if you can spare anything, please drop by the page and donate. I’ve never met or contacted the Gralls, but Canaan seems like a good guy, and his family could use a hand or two right now. Thanks.